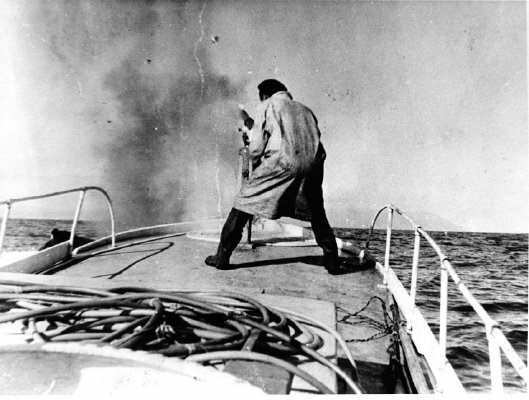 Description A black and white photograph showing one of Perano's harpoon gunners in for the kill on a whale boat in Cook Strait. Information as typed by Norm Brayshaw: "Whaling. One of Perano's gunners in for the kill. Whaling in Cook Strait, one humpback the prize, visible on the left." There is a 6.5" x 4" copy of this photograph in the same packet. The balanced stance of a harpooner. One of Perano's gunners in for the kill. Although he has the gun to hold on to, the bow will plunge up and down in a dangerous fashion for him. The violence of the explosion is captured as he has just fired a harpoon into the Humpback Whale, seen through the port handrail. The harpoon rope lies in the scupper to his left. If the harpooned whale dived down, or tore away for kilometers near the water surface to escape the pain in its side, the harpooner had to be well clear of the rope.